In Croatia you can choose to marry at various destinations – in a villa, on a beach, at an agrotourism or on a private island. Use Venue Finder to get a venue suggestion. We organize weddings on venues in Istria: Rovinj, Pula, Poreč, etc. Keep in mind that we can offer more venues than displayed on the website. If you can’t find a venue you like, contact us. 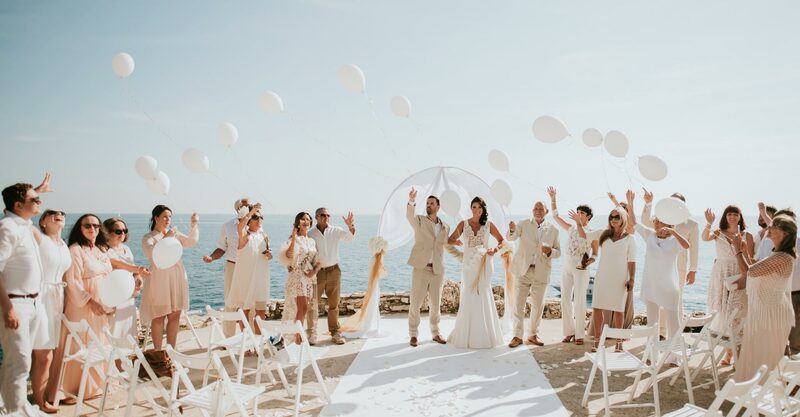 Wedding planners from Flammeum have over four years of experience with organizing weddings in Istria. We give our best to meet and exceed newlyweds’ expectations. We help you choose a venue and vendors’ services, we are available 24/7, and we coordinate the wedding, so you can enjoy it. Two wedding planners are booked for each wedding, so nothing is left to chance. Destination Weddings in Croatia are increasingly popular. We try to provide answers to most of the frequent questions through our FAQ page. If there is a specific question you want answered, don’t hesitate to contact us anytime. Don’t forget to read our blog for more information on wedding planning in Croatia. Event & Wedding Planning Agency Flammeum will help you wake up a dreamer inside you, organize a wedding you have always dreamed of and write your own tale. Gather your family and friends. Leave everything else at our concern! You don’t want to spend weeks or months searching for appropriate venue, photographer, musicians, florist, etc., while simultaneously checking their reliability and availability. Are you insecure if you will be able to single-handedly coordinate venue staff and vendors, while not forgetting to enjoy yourself? Wedding Planner will help you to remember your big day just as it should be – big, not diminished by any stressful events. Because we are creative, enthusiastic and possess broad experience and knowledge in the wedding organizing industry. We surrounded ourselves with quality partners, whose worth lies in years of experience. In harmony of being well organized and innovative, we strive to achieve common goal – to bring your dreams to life. Our partners are the key to your satisfaction and our success. We recommend only the most suited vendors for your wedding. Their service is crucial for the ceremony outcome. Thus it is most important to choose the right vendors, which will complete their assignments immaculately. Our partners provide high quality service.